Not to be confused with World 4-5. 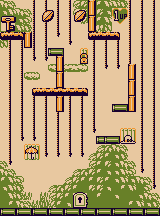 Stage 4-5 is the fifth level in Jungle in the Game Boy of Donkey Kong. The level features many vines and introduces Dorakyū, vampire bat enemies which don't defeat Mario but do stun him if they touch him. Mario starts off on flat ground. He must jump up to a vine to the right and climb it while avoiding a Dorakyū as touching one will make him fall and if he falls too far he will get defeated, once he reaches the top of where he needs to go he can climb up some more and grab a 1 UP Heart above a platform then go back down. Mario must go left across vines through the opening between two platforms where on a platform there lies a Kānyī which will try to snap him so Mario must avoid the crab's claw and go underneath the platform the Kānyī lies on and go across to the left then climb up while avoiding another Kānyī and Dorakyū then he must go across to right then climb up where he can knock down some Fruit to defeat the Dorakyū and the Kānyī below him. Once up there he must go over to the platform with the key and grab the key make it down, he must throw the key and quickly climb down the vines to get to the key then he must grab it again and take it to the door to end the level. Hat: Between the platform and Vines which are both above where Mario starts. Parasol: Surrounded by vines. Mario must get on the lowest vine which is closest and grab it. Bag: In the area with a Dorakyū and Kānyīs where it is above the Kānyī on the right side of the wall. This page was last edited on December 9, 2018, at 07:21.